HAH I beat everyone to it. :stick tongue: And I'm still at the hotel, neener! aaaannndd the mosaic boy I got. More to come maybe once I drive home.. Your pictures turned out awesome! Sorry I didn't get to visit with you more. I will have you all know that Denise is holding my precious Gizmo, who graciously submitted to being the model for the e-jacket demo. It was so awesome rooming with you, and Diaz is a wonderful little girl! A million gliders, a hundred thousand dogs, a thousand cats, a couple hundred cows and pigs, a dozen birds and a snake! LOL, at least thats what it feels like anyway. It was a pleasure to meet you Sabby, and to hang out with a fellow Kentuckian! I am thrilled to hear that you found a mo boy at the SGGA. Congrats! You should be our official photographer at any events you are able to attend. Can't wait to see more of your pics! i loved all the pictures and that little chihuahua is a cutie. i have a little black/brown chihuahua, gotta love em. gliders were gorgeous and congrats on your new mosaic. Thanks for sharing your pictures, those of us that could not make it will enjoy seeing all the fun you had. That little chihuahua is Peanut. I met him at the SSS at Sari's house. He's a little doll baby. Hi Tara! Peanut and I missed you girl! Wonderful pics, can't wait until more is posted. Julie has over 400 in her camera! Awesome picts Sab!! What a sweetie you are!! Once again this year, I didnt even break out my camera....I am such a slacker, but I seen so many other cameras I knew there would be lots and lots of pictures to go around. Julie was a snapping gal for sure, cant wait to see some of them she got!! Good pics! what kind of camera do you have?! Sheesh! I hope more folks post pics! Oh, and label who is in pics too, please! nancy1202 wrote: You should be our official photographer at any events you are able to attend. Can't wait to see more of your pics! I don' think many turned out that well, a lot of mis-focuses, but I would still be honored to be an "unofficial" photographer if an event I cana ttend comes my way--just tell me where to be and who to shoot/what shots and I can do my best! Thank you! Sorry I can't respond to more replies, I am actually lost somewhere in Indiana.. who knew my reversed directions would take me to somewhere that the entire highway I needed to transfer onto was closed. I don't have GPS or even a Map. ANNNNNNNDDDDDDD I have this really huge sinking feeling I left my phone on the roof of my car as I packed and drove off... I even came back looking for it but it appears to be gone. I took the chance at this gas station here to empty my bags again in the dark. :( This is ridiculous I can't go anywhere without craziness! Hahaha, ah well..
Short updaye - I finally made it back with one more delay. I felt he was paying too much attention to his neuter area and saw a tiny bit of red like a developing sore from overgrooming and I am pretty certain I just traumatized the caca out of my baby already. I e-collared him so that took an extra half-hour/45 minute rest stop break and we had a burrito battle of trying to keep him still without hurting him and then finding the right adjustment size on the collar.. by the end he didn't really like my hands and he would turn his back on me and hunch down, lower his ears, bury his face in his chest, and just sulk when I tried to pet him. I actually teared up because of this... I am pretty convinced I just blew a critical bonding period thing here and more than that I simply scared him and he already had enough! I just kept him in the pouch the last hour and he fell asleep in my hand again. I'll make a bigger "yay new glider" upload since despite that scary story he is absolutely just SO shockingly friendly and inquisitive...he was let out on my bed and jumped around me and then jumped right on me --especially once I put my hair down. ;P SO. CUTE. Duh of course photos when I wake up!! Also guys do think about it, what if at the next SGGA or a gathering I can go to we have some sort of photo booth or option? I mean I wouldn't see a need to charge for my services but maybe "Photos with Gizmo" or whomever type stuff, or just your own. Who knows! I MUST sleep guys, will have photos tomorrow for sure and news on if he ate his poor empty coinpurse or not. Pfththt. 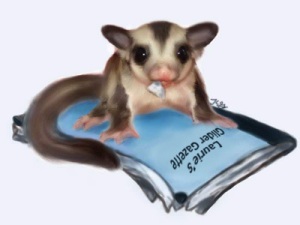 I hope all are safe and gliders are great! PHOTOS! I knew it!! I knew Tianna & Sabarika were bonding while I was sleeping! I thought I heard them talking a wee bit when T was on her way out the door. Wish I had been coherent...lol. So glad your little one is doing well, Sabby. Thank you so much for splitting the room with me the last night, Diaz was an angel! 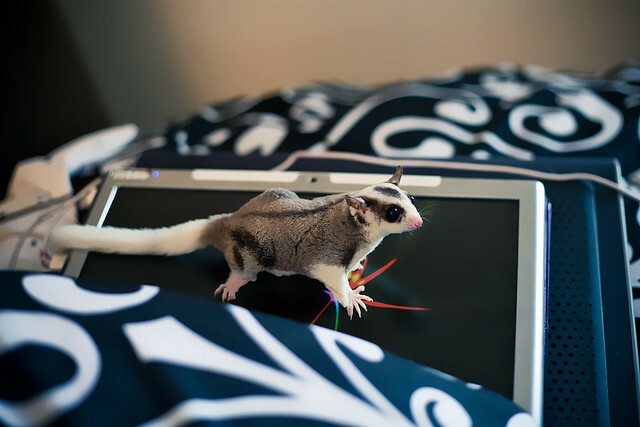 Feel free to post any pictures you have of me and my gliders. :Smile: I hope more people post pics on here, cuz I'm having a hard time tracking them all down on facebook. Brenda lol tried to be quiet but she's loud! Lol! And we need like a official site everyone can upload pictures to and tag peo ple in them so we can find them easier! XD Oh guys, sorry Brenda, didn't mean to disturb your beauty sleep! Thank YOU for having Diaz and I in your room! PS: oh and I will upload to FB and tag with SGGA so you guys can tag yourselves.